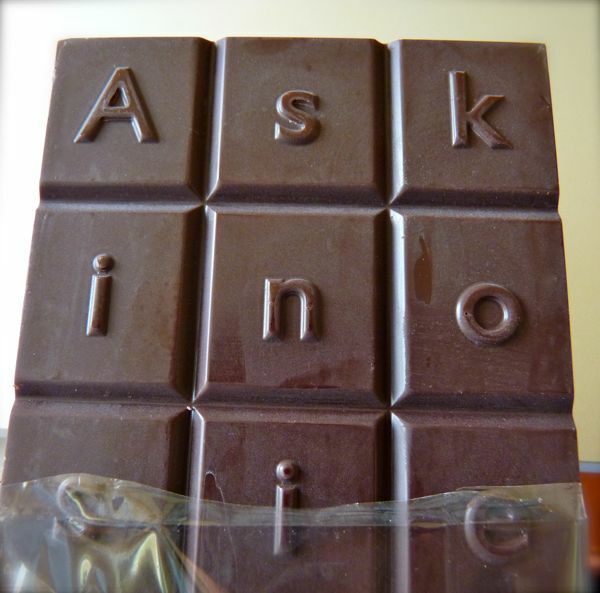 This farmer-forward, 70% dark chocolate bar from Askinosie Chocolate (Springfield, Missouri), broke with a hard snap. 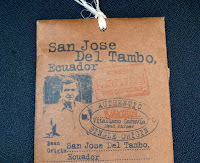 And chocolate was smooth and rich, with a relatively tame flavor arc -- without any strong acidic, or harsh notes. Askinosie Chocolate founder and chocolate maker, Shawn Askinosie, stresses "real people, real places" -- and the picture you'll see on this package is a likeness of Vitaliano Saravia, who "helped gather and ferment the cocoa beans" in Ecuador for this bar (Lot #052511, made with Arriba Nacional variety cacao beans). 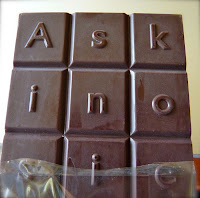 Last, but not least, I do like the letter tile mold for Askinosie bars. One day I'll purchase enough bars to play a game of chocolate scrabble with a few fellow chocolate lovers.